Berry in Örebro, Sweden on July 18, 2007. Charles Edward Anderson "Chuck" Berry (born October 18, 1926 in St. Louis, Missouri) is an American guitarist, singer, and songwriter. In terms of performance, song-writing, and guitar playing, Berry is considered one of, if not the greatest of the pioneer rock-and-roll artists. His catalog of early rock hits includes some of the most iconic songs of the genre, many of which became hits again when covered by later artists. The Rock and Roll Hall of Fame includes three of Berry's songs—"Johnny B. Goode," "Maybellene," and "Rock & Roll Music"—among its "500 Songs that Shaped Rock and Roll." Other classic hits for Berry include "Roll Over Beethoven," "Sweet Little Sixteen," School Days, and "Memphis, Tennessee." Known as the "Poet Laureate of Rock and Roll," Berry's string of hits in the mid-late 1950s came to an end when he ran afoul of the law in 1959 and spent the next several years in a youth reformatory. He continued to reach high on the pop charts after his release in 1963 with songs like "No Particular Place To Go," "You Never Can Tell," and "Nadine." In 1972, he reached number one with a live recording of "My Ding-a-Ling." A perennial favorite as a live performer, he toured constantly in the 1970s and 1980s except for another break to serve time in prison in 1979. Even today, he still performs weekly. Berry was among the first musicians to be inducted into the Rock and Roll Hall of Fame on its opening in 1986. He received Kennedy Center Honors in 2000. In 2004, Rolling Stone ranked him number five on their list of "The Immortals: The First Fifty." He was also ranked sixth on Rolling Stone's list of 100 Greatest Guitarists of All Time. Born in St. Louis, Missouri, USA, Berry was the third child in a family of six. He grew up in the north St. Louis neighborhood known as "The Ville," where many middle-class blacks lived at the time. His father was a contractor and a deacon of a nearby Baptist church, while his mother worked as a school principal. His middle-class upbringing allowed him to pursue his interest in music from an early age, and he made his first public performance while still in high school. However, in 1944, before he could graduate, Berry was arrested and convicted of armed robbery in a car-jacking episode with two friends. Sentenced to ten years, he was released early from the Intermediate Reformatory for Young Men at Algoa, near Jefferson, Missouri on his twenty-first birthday in 1947. Berry had been playing the blues since his teens and inherited some of both the guitar riffs and grandstanding done earlier by jump-blues player T. Bone Walker. By early 1953, he performed with the Johnnie Johnson Trio at a popular club called The Cosmopolitan, in East St. Louis. He also played country music, sometimes provoking comments from his predominantly black audiences about the "that black hillbilly at the Cosmo." Berry's calculated showmanship soon began luring larger white audiences to the club. Included in his repertoire were songs ranging from Nat "King" Cole to Muddy Waters. In May 1955, Berry traveled to Chicago where he met Waters himself, who suggested he contact Leonard Chess of Chess Records. Berry thought his blues material would be of most interest to Chess. To his surprise it was an old country-and-western recording by Bob Wills, entitled "Ida Red," that got Chess's attention. Chess had seen the blues market shrink and was looking to move beyond the rhythm and blues market, and he thought Berry might be the artist who could do it. The result was the "Ida Red"-inspired "Maybellene," with Johnny Johnson on piano, Jerome Green (from Bo Diddley's band) on maracas, Jasper Thomas on drums, and blues legend Willie Dixon on bass. "Maybellene" sold over a million copies, reaching number one on Billboard's Rhythm and Blues chart and number five on the pop "Hot 100". At the end of June 1956, Berry's song "Roll Over Beethoven" reached number 29 on the Billboard Top 100 chart, and his touring show was one of the nation's top acts. When he and rockabilly artist Carl Perkins toured together, Perkins discovered that Berry truly liked country music and that Jimmie Rodgers was one of his favorites. "Chuck knew every Blue Yodel" and most of Bill Monroe's songs as well, Perkins said. In the autumn of 1957, Berry joined the Everly Brothers, Buddy Holly, and other rising stars of rock and roll to tour the United States. His hits continued from 1957 to 1959, with Berry scoring over a dozen chart singles during this period, including the Top-10 U.S. hits "School Days," "Rock and Roll Music," "Sweet Little Sixteen," and "Johnny B. Goode." Berry appeared in two early rock movies. The first was Rock Rock Rock, released in 1956, where he is shown singing "You Can't Catch Me." He had a speaking role as himself in the 1959 film Go, Johnny, Go! along with Alan Freed, and is also shown performing his songs "Johnny B. Goode," "Memphis, Tennessee," and "Little Queenie." By the end of the 1950s, Berry was an established star. He had also established his own St. Louis-based nightclub, called Berry's Club Bandstand. In December 1959, however, he encountered serious legal problems after he invited a 14-year-old Apache waitress whom he met in Mexico to work as a hat-check girl at his club. After being fired from the club, the girl was arrested on a prostitution charge, and Berry was arrested under the Mann Act. After two trials, Berry was convicted, fined $5000, and sentenced to five years in prison. This event, coupled with other early rock-and-roll scandals such as Jerry Lee Lewis's marriage to his 13-year-old cousin and Alan Freed's payola conviction contributed to rock and roll's image problem that limited its acceptance into mainstream U.S. society. When Berry was released from prison in 1963, his musical career enjoyed a resurgence due his songs being covered by many of the British invasion acts of the 1960s — most notably the Beatles and the Rolling Stones. Additionally, The Beach Boys' hit "Surfin' USA" also paid homage to Berry's by borrowing the melody to "Sweet Little Sixteen." In 1964–65 Berry resumed recording and placed six singles in the U.S. Hot 100, including "No Particular Place To Go" (number 10), "You Never Can Tell" (number 14), and "Nadine" (number 23). In 1966, Berry left Chess Records, moving to the Mercury label. The hits stopped coming during the Mercury era, but he was still a top concert draw. In July 1969 Berry was the headliner of the Schaefer Music Festival in New York City's Central Park, along with The Byrds, Miles Davis, Fleetwood Mac, Led Zeppelin, B.B. King, The Beach Boys, Frank Zappa, and Patti LaBelle. After a four-year hitless stint, Berry returned to Chess from 1970 to 1973. His 1970 Chess effort Back Home yielded no hit singles. However, in 1972 Chess released a new live recording of "My Ding-a-Ling," a song Berry had initially recorded years earlier as a novelty track. The track became Berry's only number one single, and it remains popular today. A live recording of "Reelin' And Rockin'" was also issued as a follow-up single that same year and would prove to be Berry's final top-40 hit in both the US and the UK. 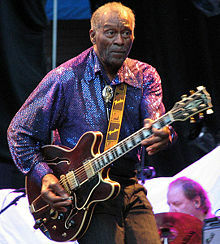 Both singles were featured on the part-live/part-studio album "The London Chuck Berry Sessions." Berry's second tenure with Chess ended with the 1973 album Bio, after which he did not make a studio record for six years. In the 1970s, Berry toured without a traveling band, confident that he could hire musicians that already knew his music no matter where he went. Among the many bandleaders performing this backup role were Bruce Springsteen and Steve Miller, when each was just starting their careers. Springsteen related that Berry did not even give the band a set list and expected the musicians to follow his lead after each guitar intro. This resulted in erratic quality, but audiences were nearly always pleased by Berry's charisma, stage antics, and his classic songs. Berry's type of touring style, traveling the "oldies" circuit in the 1970s — where he was often paid in cash by local promoters — added ammunition to the Internal Revenue Service's accusations that Berry was a chronic income tax evader. Facing criminal sanction for the third time, Berry pleaded guilty to tax evasion and was sentenced to four months imprisonment and 1000 hours of community service — doing benefit concerts — in 1979. 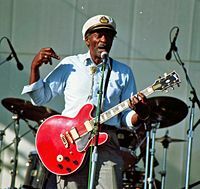 At the request of Jimmy Carter, Chuck Berry performed at The White House on June 1, 1979. In the same year, he released Rockit for Atco Records, his last studio album to date. Berry continued to play 70 to 100 one night stands per year in the 1980s, still traveling solo and requiring a local band to back him at each stop. In 1986, Berry starred in the documentary film, Hail! Hail! Rock 'n' Roll, featuring a celebration concert for Berry's sixtieth birthday and produced by Taylor Hackford. Keith Richards was the musical leader of the tribute, while Eric Clapton, Etta James, Julian Lennon, Robert Cray, and Linda Ronstadt, among others, appeared with Berry on stage and film. Currently, Berry usually performs one Wednesday each month at Blueberry Hill, a restaurant and bar located in the Delmar Loop neighborhood in St. Louis. In the spring of 2008, Berry toured Europe, with stops in Sweden, England, Ireland, Switzerland, and Spain. He also played in the Virgin Mobile Music Festival 2008 in Baltimore, Maryland. Beyond his catalog of classic hits that defined the genre as much as any other performer, Chuck Berry was a significant influence on the development of early rock-and-roll guitar techniques and a major catalyst in the transition from rhythm and blues and rockabilly to rock and roll. According to the Rock and Roll Hall of Fame's website, "While no individual can be said to have invented rock and roll, Chuck Berry comes the closest of any single figure to being the one who put all the essential pieces together." He was the first to define the classic subjects of rock and roll in his songwriting: cars, girls, and school. His guitar style is legendary and many later guitar musicians acknowledge him as a major influence in their own style. Jerry Garcia, of The Grateful Dead, has cited Chuck Berry as a major influence as have the Beatles, the Rolling Stones, The Who, and Bob Dylan. The Beach Boys' hit "Surfin' USA" resembled Berry's "Sweet Little Sixteen" so closely that they eventually gave Berry a co-writing credit in order to avoid a lawsuit. Berry was awarded the Grammy Lifetime Achievement Award in 1984. In 2003, Rolling Stone named him number six on their list of the 100 Greatest Guitarists of All Time. His compilation album The Great Twenty-Eight was also named twenty-first on the magazine's list of the 500 Greatest Albums of All Time. In 2004, six of his songs were included in Rolling Stones "The 500 Greatest Songs of All Time" list, namely "Johnny B. Goode" (number seven), "Maybellene" (number 18), "Roll Over Beethoven" (number 97), "Rock and Roll Music" (number 128), "Sweet Little Sixteen" (number 272) and "Brown Eyed Handsome Man" (number 374). Also in 2004, Berry was rated number five in Rolling Stones 100 Greatest Artists of All Time feature. Note that not all of Berry's UK singles were released in the same year as the initial US release, and not all of Berry's UK singles featured the same A-Side/B-Side configurations as in the US. Billboard did not publish a separate R&B singles chart in 1964, hence Berry's absence from the R&B charts for the singles "Nadine" through "Promised Land". This page was last modified on 21 February 2017, at 16:14.